101 TriBeCa, a 63-story, $735-million condo tower, broke ground in late July in Manhattan, thanks in part to $175 million raised through the EB-5 program by U.S. Immigration Fund. EB-5 investor program teethes on the brink of expiration next month. And proposed changes to its requirements — tied inexorably to the larger issue of immigration reform — have made it yet another congressional hot potato. With the program’s September 30th sunset date quickly approaching, a growing number of supporters are joining advocacy efforts supporting reauthorization. Both the U.S. Conference of Mayors and the National Association of Counties recently adopted resolutions affirming their support for the program, says Invest in the USA (IIUSA), a trade association representing more than 240 EB-5 Regional Centers. 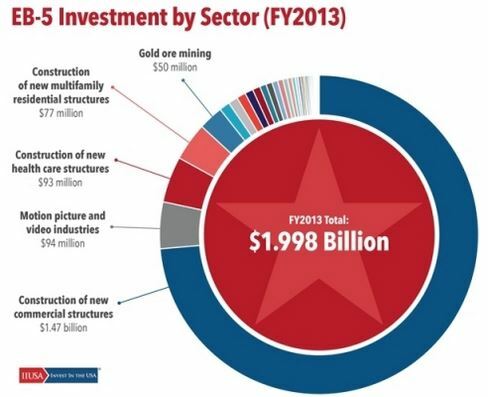 Nearly 75 percent of FY 2013 EB-5 investment capital was invested in the construction of new commercial structures. According to FY 2015 second quarter data released June 2 by USCIS, the EB-5 program saw $989 million contributed to FDI in Q2, the highest total in program history. (Minimum FDI is calculated by multiplying the number of I-526 Approvals by the minimum investment amount $500,000). Through two quarters, EB-5 has contributed over $1.8 billion to U.S. FDI in 2015, compared to a total of $2.55 billion in FY 2014. There were 1,978 I-526 approvals during Q2, an increase of 20 percent from Q1 and 38 percent year-over-year.